Private St. Paul Private Tour Includes: Our St. Paul tour includes private transportation to and from the port, English speaking tour guide, taxes, tolls and parking. Not Included: Entrance Tickets and cost of wine tasting. NOTE: Customize this St. Paul de Vence private tour to address your unique needs. Perfect for families with kids, seniors and those with mobility issues. 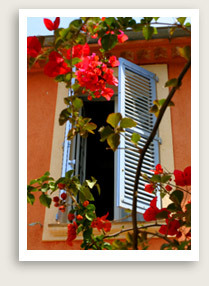 Discover one of the jewels of Cote D’Azur on this private half-day St. Paul de Vence private tour. You will have a private tour of St. Paul de Vence, a spectacular walled-fortress village, which was home to such famous painters as Renoir, Chagall, and Picasso, not to mention many film stars. You will then have free time to enjoy exploring St. Paul’s ancient cobblestone lanes, fortified walls and art galleries. While you are here, you might get a chance to see a game of French boules – rural France’s favorite game – and drink anise-flavored pastis with the locals. Your St. Paul de Vence private tour then takes you will drive to St. Jeannet, a quiet wine-making village surrounded by terraced vineyards dating from Roman times. You will learn the secrets and subtleties of wine during a tasting with the winemaker.